Economically, a gain of 155k payrolls in November and slight downward revisions to prior months (-12k) are not a cause for major concern. On the margin, it’s better to see smoother growth. That said, this is an earlier moderation than most of us expected. Wages continued their recent trajectory. We appear to be shifting from a sub-3% range to a just-above-3% range for wage growth, with downward revisions to the October number bringing the 12-month figure to 3.1% for the past two months. The household survey was mostly positive and unremarkably on trend. The unemployment rate held steady. For investors, of course, this is the new Goldilocks: still strong-enough job growth, but a more cautious Fed will be good for market sentiment and overall business confidence. Payrolls: We’re just one more 150k print away from a 3-month average of 180k, which would be a pretty 2017-ish trend – and what most economists had been predicting before fiscal stimulus entered the picture. 155k is still comfortably more than enough to absorb new entrants into the labor market. Wages are still rising (up 3.1% over the last 12 months, same as October), but it’s not clear how quicly their pace of gains will accelerate. 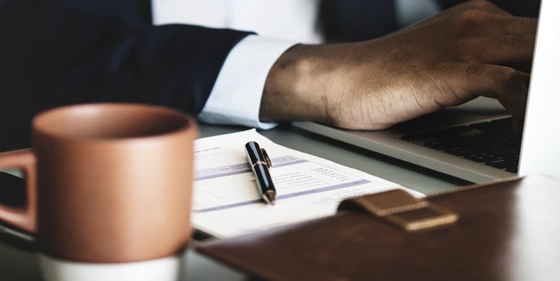 Breaching 3% last month sounded like a big deal – and it was certainly good news for workers – but it's still not clear that's a harbinger of a traditional wage spiral. Workers have more bargaining power now, but with headline inflation softening, they may be a touch less insistent on pounding the table, and we already have plenty of evidence suggesting the wage-setting process is a complicated one. Manufacturing (+27k vs. +26k prior): Still almost no sign tariffs and trade fears or even the strong U.S. dollar is having an impact. There was a little bit of weakness in auto parts manufacturing, but that’s no shocker after recent headlines. Most other declines in manufacturing sub-sectors were in non-durable goods, aside from fabricated metals and miscellaneous durable goods. Retail had a mixed month (+18.2k vs. -7.1k): lots of small losses spread across the subsectors, but outweighed by a jump in general merchandise stores. 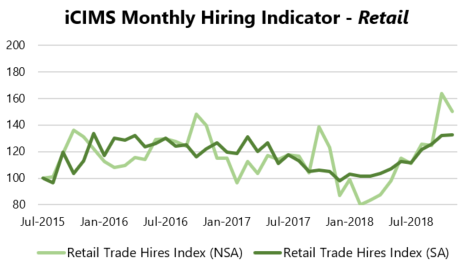 iCIMS data showed retail hiring spiking in October, and it looks like a lot of those workers didn’t hit the payrolls until November – consistent with our view that retailers had been stockpiling workers ahead of the holiday season. Also, gains in the sectors adjacent to retail and salient for e-commerce (9.5k for wholesale trade and 25.4k for transportation/warehousing) underlined concerns about how well the BLS surveys are tracking shifts in the underlying structure of the economy. The unemployment rate held nominally steady at 3.7%, but on an unrounded basis, it declined from 3.74% to 3.67% – twice as fast as the average decline over the last 6 months. Only the ranks of the short-term unemployed rose, not long- or medium-term, and on net, the different categories of "reason for unemployment" all declined. Labor force participation saw a similar story: nominally static, but actually a very slight increase to 62.92% from 62.91%. That’s in the upper end of the range of since early 2016, but not an extreme value. The under-employment rate ticked up to 7.6% from 7.4%, as involuntary part-time employment rose by 181k. Over the last three month, the U6-U3 spread has inched back up to its early 2018 levels, so this rise in underemployment is something to keep an eye on. Still, the U6 rate may just be bouncing around a bit, and we need more evidence to call a trend. For now, it still looks like we are headed toward a reversion to the pre-stimulus dynamic: modest GDP growth and healthy job growth. With wage costs rising (and potentially other input costs too), I can see why markets are nervous as they look ahead, but unless markets fall enough to undermine business confidence in a more fundamental way, Fed hikes start to have more bite, or wage or other input costs hit some critical threshold, I’m not sure the apple cart’s going all the way over. Remember that some cooling and froth-tamping is exactly what the Fed is trying to accomplish. I don’t believe the Fed would be content with "Dec. & done" as some have suggested – and certainly not to commit to that anytime soon – but I agree policy makers might tease or explore the possibility as they monitor how economic data and markets are evolving. The hard Powell put (actual policy action) is quite a bit lower than what financial markets have seen so far, but it looks like the soft Powell put (a soothing voice at the pulpit) appears to have already been triggered.